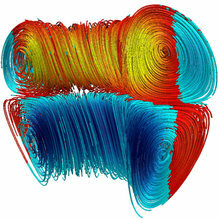 We investigate by numerical simulation the rotational flows in a toroid confining a conducting magnetofluid in which a current is driven by the application of externally supported electric and magnetic fields. The computation involves no microscopic instabilities and is purely magnetohydrodynamic (MHD). We show how the properties and intensity of the rotations are regulated by dimensionless numbers (Lundquist and viscous Lundquist) that contain the resistivity and viscosity of the magnetofluid. At the magnetohydrodynamic level (uniform mass density and incompressible magnetofluids), rotational flows appear in toroidal, driven MHD. The evolution of these flows with the transport coefficients, geometry, and safety factor are described.